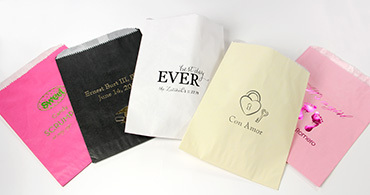 A great choice for weddings and parties alike, personalized goodie bags can be filled with all sorts of little things for your guests to take home. Choose your bag and print color, then personalize with your choice of motif, font, and imprint color. 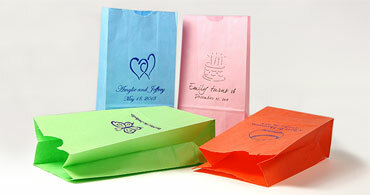 Send guests home with cake, candy, or other favors in our personalized cake bags. 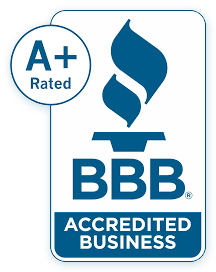 Choose a color, then personalize with your choice of motif, font, and imprint color. Personalized cake boxes are offered in your choice of motif, font, names, date and foil imprint color for your wedding or other big event. Fill with a cake, candy, baked goods, or other favors or trinkets. A classic wedding or party favor, our personalized matchbooks come in 2 styles and are wrapped in your choice of premium specialty paper. 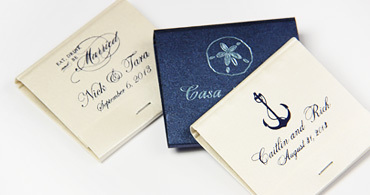 Choose your motif, font, and foil imprint color to customize for your big event. 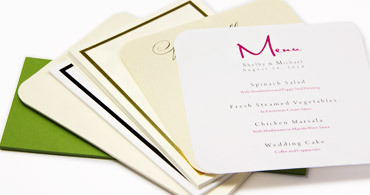 Add to your wedding table decor with one of our trendy printable wedding menu cards. Shop dozens of classic and contemporary designs to complement your wedding, then download the free print template to conveniently print at home.